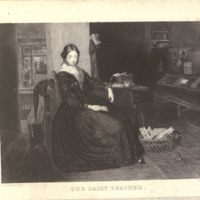 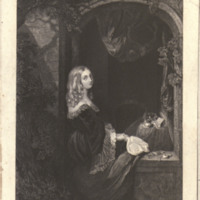 Mid 19th century Victorian print of a woman with both of her hands on an open book. 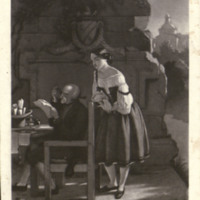 Mid 19th century Victorian print of two women, one counseling the other, in an outdoor setting. 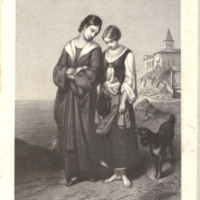 It appears that they are on a beach or other coastal area and a dog is near them as well while a castle is visible in the background. 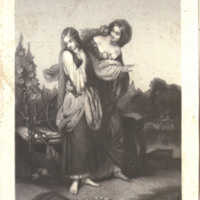 Mid 19th century Victorian print of two women, one with her arm on the othe and with long, flowing hair. 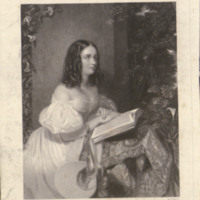 They are outside and a canoe appears in the background. 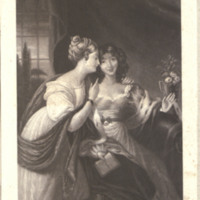 Mid 19th century Victorian print of two women, one holding a book and who appears to be whispering or talking to the other one. 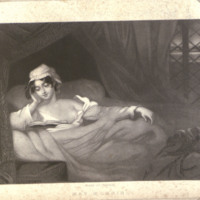 Mid 19th century Victorian print of a woman laying in bed with her hand on her head. 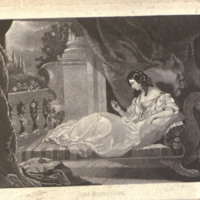 Mid 19th century Victorian print depicting a woman laying on a couch and looking to a miniature mirror. 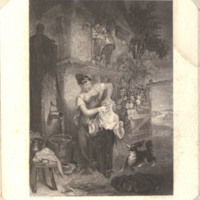 Mid 19th century Victorian print of a woman looking forward but turning towards a balcony or hallway.